Day at a Glance Wednesday, July 12. 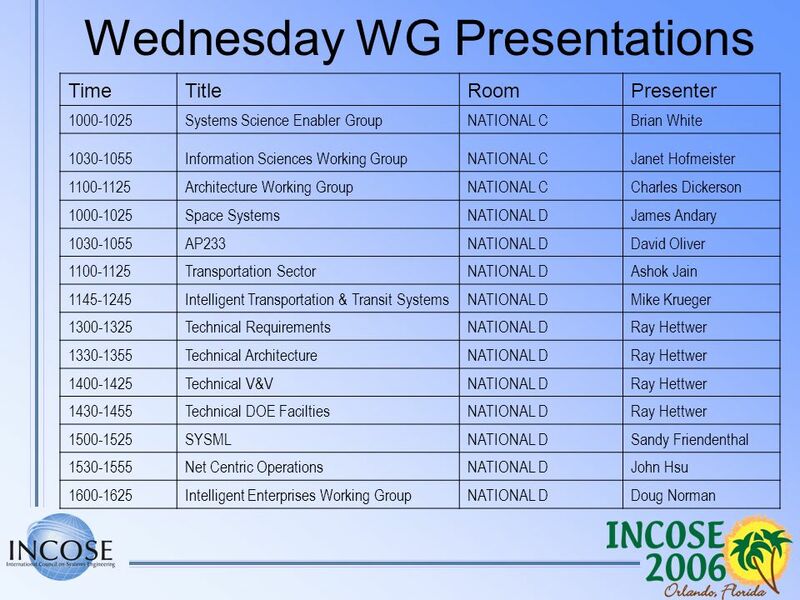 Wednesday at a Glance (1 of 2) 0700 - 0745Speakers/Session Chairs Breakfast - ChampionsGate 0700 - 1700Symposium Registration. 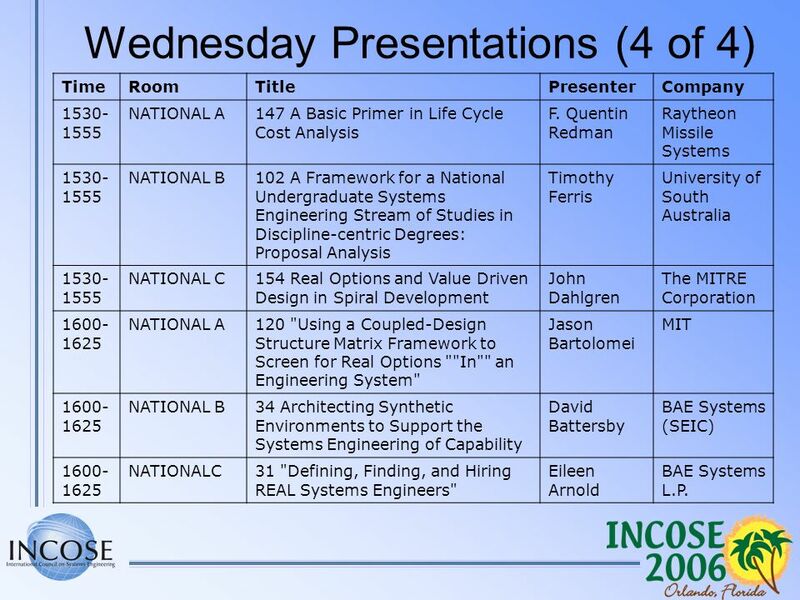 11 Wednesday Presentations (4 of 4) TimeRoomTitlePresenterCompany 1530- 1555 NATIONAL A147 A Basic Primer in Life Cycle Cost Analysis F. Quentin Redman Raytheon Missile Systems 1530- 1555 NATIONAL B102 A Framework for a National Undergraduate Systems Engineering Stream of Studies in Discipline-centric Degrees: Proposal Analysis Timothy Ferris University of South Australia 1530- 1555 NATIONAL C154 Real Options and Value Driven Design in Spiral Development John Dahlgren The MITRE Corporation 1600- 1625 NATIONAL A120 "Using a Coupled-Design Structure Matrix Framework to Screen for Real Options ""In"" an Engineering System" Jason Bartolomei MIT 1600- 1625 NATIONAL B34 Architecting Synthetic Environments to Support the Systems Engineering of Capability David Battersby BAE Systems (SEIC) 1600- 1625 NATIONALC31 "Defining, Finding, and Hiring REAL Systems Engineers" Eileen Arnold BAE Systems L.P.
Download ppt "Day at a Glance Wednesday, July 12. 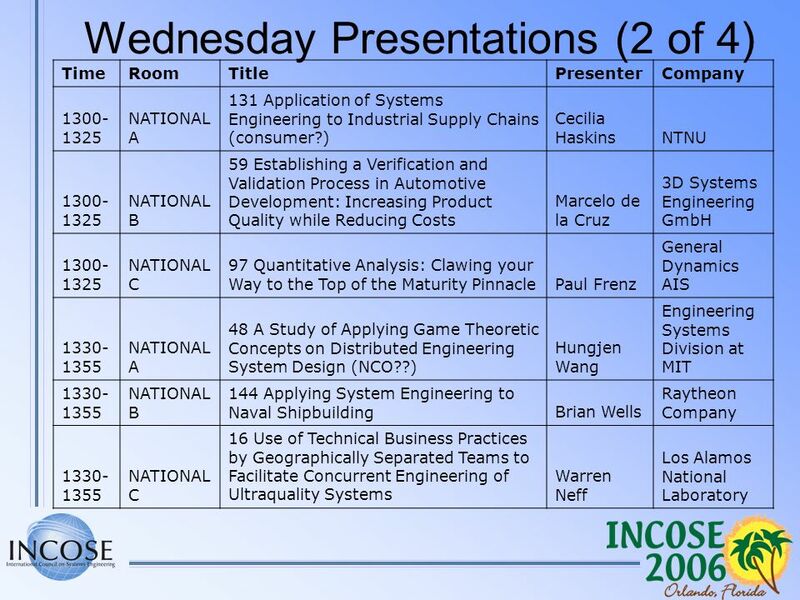 Wednesday at a Glance (1 of 2) 0700 - 0745Speakers/Session Chairs Breakfast - ChampionsGate 0700 - 1700Symposium Registration." 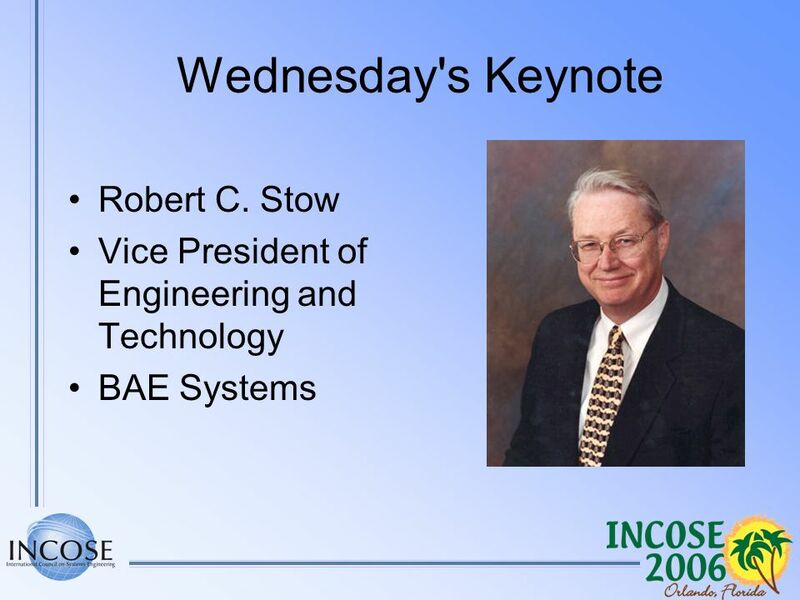 Restructuring the Aero/Astro Engineering Degree at MIT Eric Feron Laboratory for Information and Decision Systems Department of Aeronautics and Astronautics. 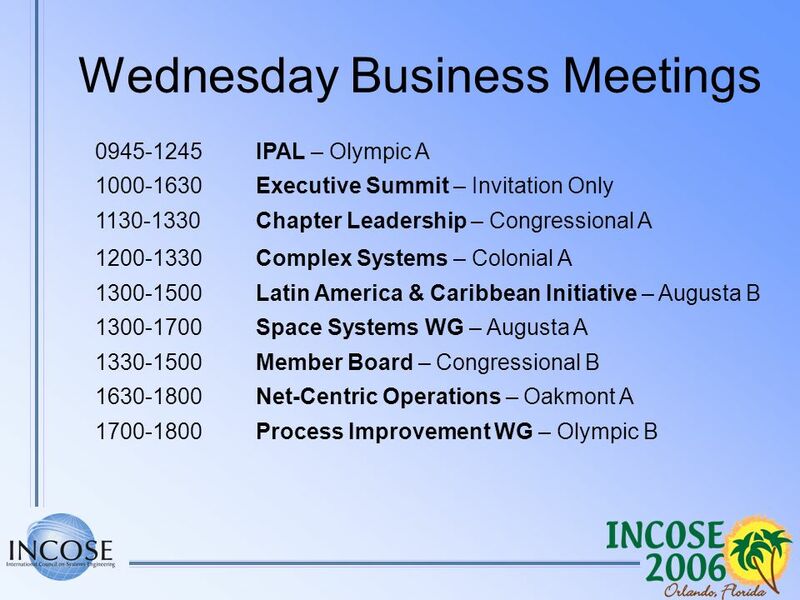 Welcome INCOSE Orlando March 17, Agenda Upcoming Meetings Chapter Business Membership Status Previous Outreach Future Outreach M&S Status Report. 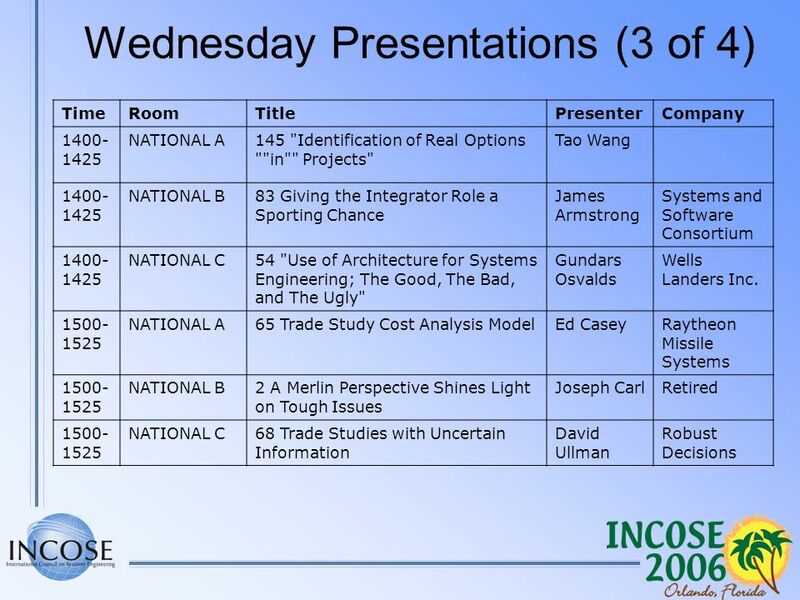 INCOSE Presentation San Francisco Chapter 13 October 2009 Mapping CMMI to Systems Engineering Adrienne Friedman. 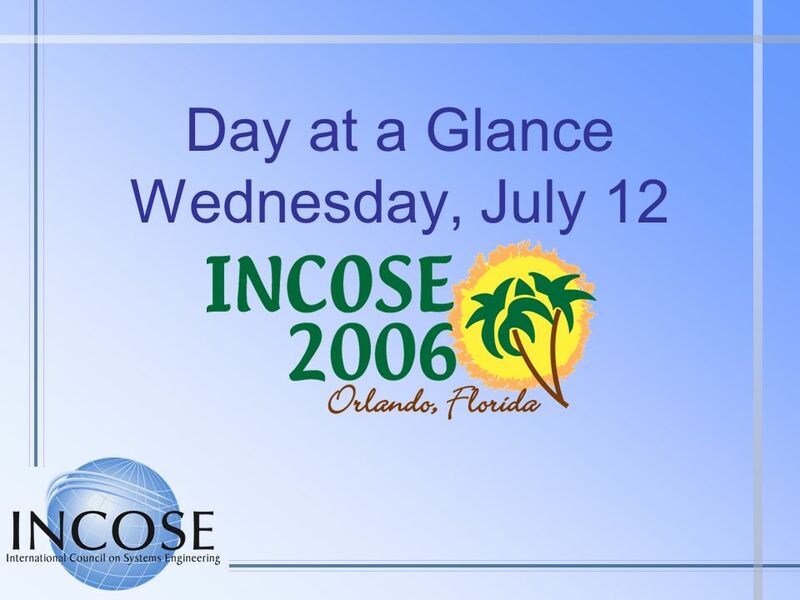 Report on the INCOSE th Annual International Symposium July 27 - August 1, 2002. Day at a Glance Tuesday, July 11. 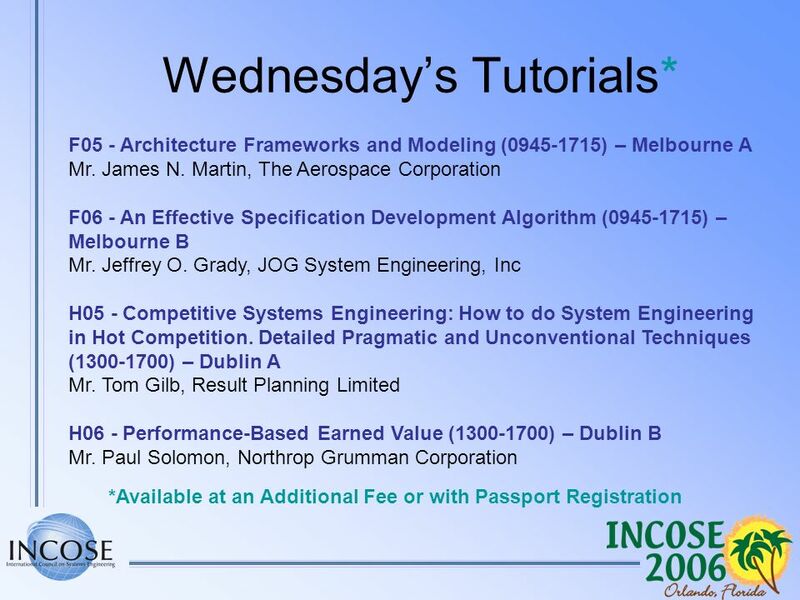 Tuesday at a Glance (1 of 2) Speakers/Session Chairs Breakfast - ChampionsGate Symposium Registration. Day at a Glance Monday, July 10. Monday at a Glance Speakers/Session Chairs Breakfast - ChampionsGate Symposium Registration – Rotunda. 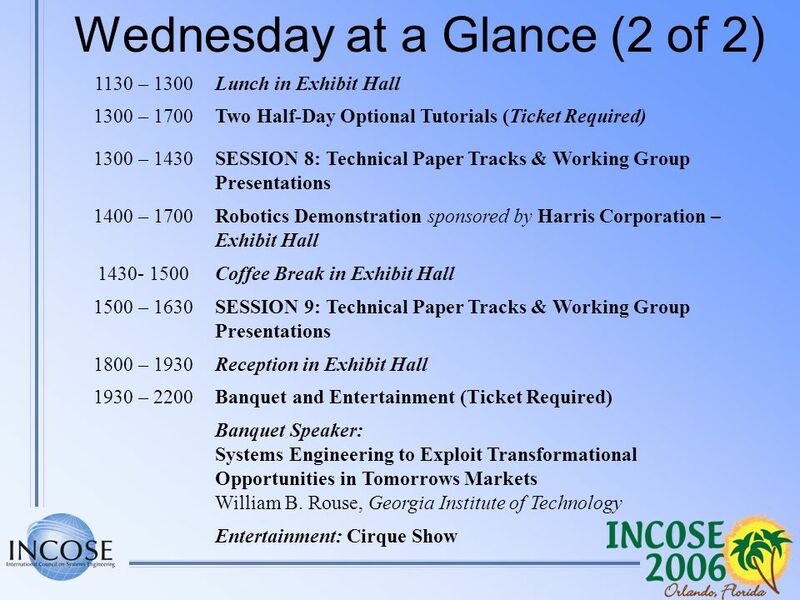 Day at a Glance Thursday, July 13. 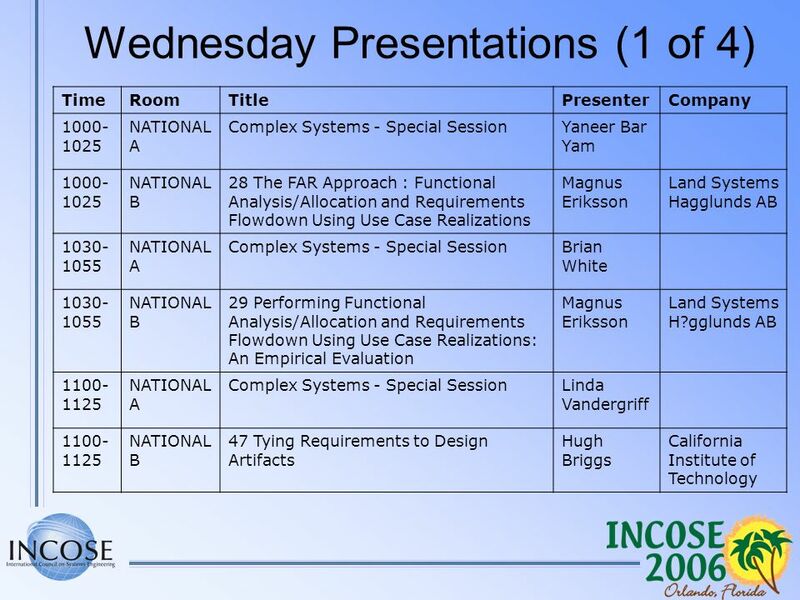 Thursday at a Glance Speakers/Session Chairs Breakfast - ChampionsGate Symposium Registration. Bloomin Taxonomy Cognitive Domain –Knowledge –Comprehension –Application –Analysis –Synthesis –Evaluation Cognitive Domain –Knowledge –Comprehension –Application. Time Management Do you control time or does time control you? Presented by: Terence Sullivan. 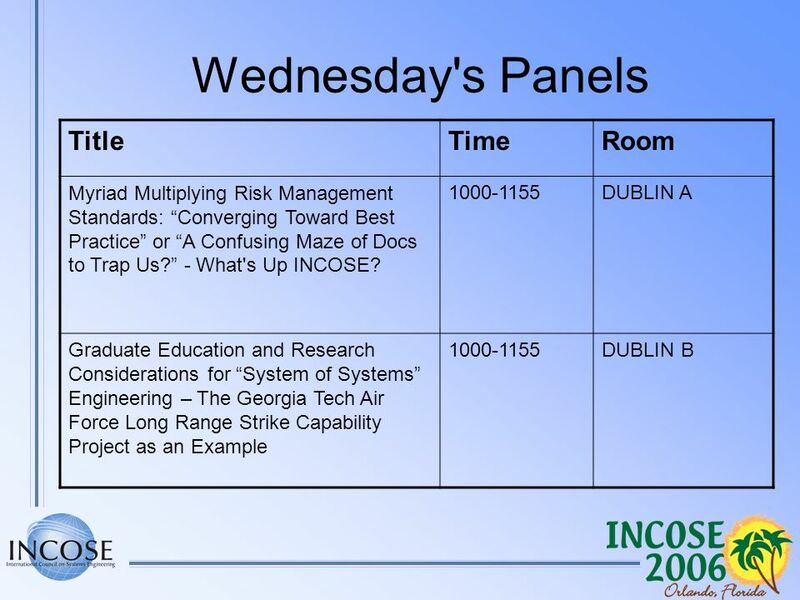 1 INCOSE Chesapeake Chapter Enterprise SE Panel Discussion L. Mark Walker/LMC 21 March 2007. 1 INCOSE Avenue of the Saints (AoS) Conference 2003 Cedar Rapid, Iowa March 2003. Program Committee Members: Masaki Hirabaru (Chair) Bu Sung Lee Markus Buchhorn Seishi Ninomiya Tan Hock Soon Yasuichi Kiramura Jaehwa Lee Koji Okamura. Day at a Glance Monday, July 10. 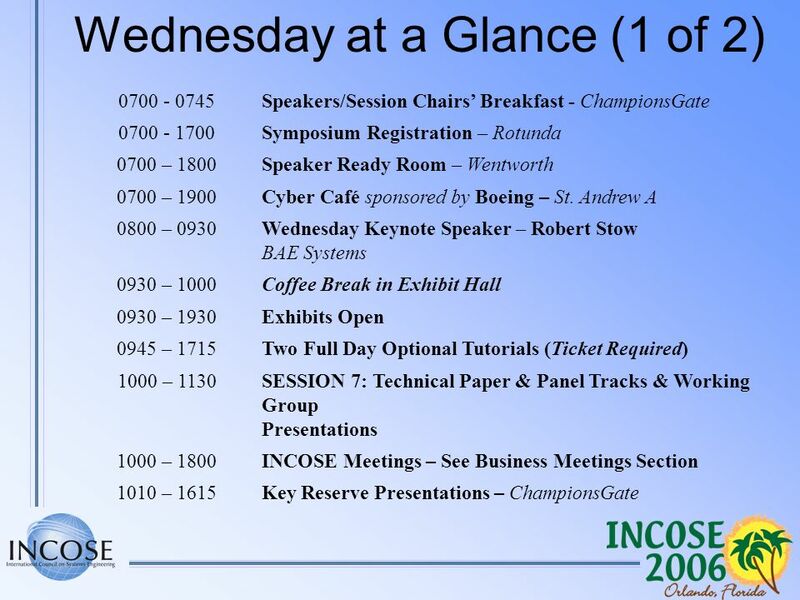 Monday at a Glance 0700 - 0745Speakers/Session Chairs Breakfast - ChampionsGate 0700 - 1700Symposium Registration – Rotunda.